Artificial Intelligence and machine learning has matured considerably over the past few years. We can now find AI projects in every industry and across every potential application and project type. In our AI vendor classification matrix, we identified over 3000 vendor companies across over 100 subsegments of the AI market implementing a wide range of AI applications. Over 70% of these vendors are applying their solutions to industry-specific domains ranging from finance or healthcare to cybersecurity or autonomous vehicles. For sure, there must be millions of different ways in which AI and machine learning are being applied. 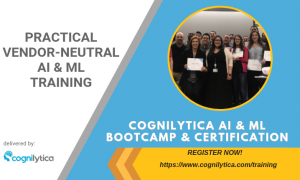 At Cognilytica, we spend a considerable amount of time on use cases and how different industries are using various AI and cognitive technologies. One of the things we’ve noticed as we’ve analyzed hundreds of different use cases, interacted with many customers, delivered our AI and ML training courses, written dozens of articles in TechTarget, Forbes, CTOVision, and CognitiveWorld, is that despite all the different variations in the projects and the implementations we found that there are only seven common patterns that seem to continuously show up in all these use cases. It doesn’t matter if you’re building a chatbot or an image recognition application, a predictive analytics tool or an autonomous vehicle. You can be implementing a very niche application for AI in a specific vertical such as mining or energy or health care, or build hardware cobots. Regardless of all these very different use cases, there are just seven patterns that seem to repeat themselves in different combinations in all these projects. Some use cases use a single pattern for their application while others combine a few together. By understanding these seven patterns, you can greatly simplify your AI projects by understanding how those seven patterns are implemented with best practices, and then apply those patterns individually or in combination with others to achieve the desired end-goals of your AI and machine learning systems. We want to spend some time diving deeper into these patterns (listed in no particular order) to detail what each pattern is all about, identify the various ways in which the patterns are used, and the primary problems they set about to solve. The hyperpersonalization pattern is defined as using machine learning to develop a unique profile of each individual, and having that profile learn and adapt over time for a wide variety of purposes, including displaying relevant content, recommending relevant products, providing personalized recommendations and guidance, providing personalized healthcare, finance, and other one-to-one insight, information, advice, and feedback. We recently had a fairly in-depth podcast discussion on the Hyperpersonalization pattern, so we encourage you to listen to that for more insight and observations on the applications of this pattern. The primary objective of this pattern is using it to treat each individual as an individual, not as a member of some grouping or bucketing into a broad category or classification. We use machine learning and other intelligent approaches of personalization to address this problem. Use cases include personalized content, personalized advice or guidance, behavior profiling, recommendation systems, and other ways of bringing information and data together specifically for the benefit of an individual. A use case that typically comes to mind when people think hypersonalization is advertising. However, there are many applications of hyperpersonalization outside of the advertising industry. We are seeing hyperpersonalization applications in finance, hyperpersonalized medicine where we can get personalized health care and medical care recommendations and treatment, and also hyperpersonalized fitness and wellness applications. Pretty much any time you could think about not treating someone like they’re in a bucket and treat him like an individual it is an application of hyperpersonalization. A good example of this in finance would be the movement away from the FICO credit scoring system, which works on “bucketing” people into credit worthiness scores to a hyperpersonalized 1:1 credit scoring system that looks at each individual’s actual credit history and uses that to create an individual assessment without using scoring. Autonomous systems are defined as systems that are able to accomplish a task, achieve a goal, or interact with its surroundings with minimal to no human involvement. This is applied both to physical, hardware autonomous systems as well as software or virtual autonomous systems (software “bots”). The primary objective of the autonomous systems pattern is to minimize human labor. That’s why we do things autonomously. Examples of this are autonomous vehicles and machines, and autonomous bots of all sorts. We also see autonomous systems in the form of automatic documentation and autonomous knowledge generation as well as autonomous processes and cognitive automation. Collaborative bots are a form of an autonomous system, even if they’re operating in an augmented intelligence role as they’re meant to operate independently of humans even though they’re in close proximity. Also in this pattern are systems that independently make decisions or where decisions needing intelligence are required without human intervention. The next pattern that we’ve identified is predictive analytics and decision support. We define this as using machine learning and other cognitive approaches to understand how learned patterns can help predict future outcomes or help humans make decisions about future outcomes using insight learned from behavior, interactions, and data. The objective of this pattern is helping humans make better decisions. Examples that we’ve identified in this pattern include forecasting, machine learning-based forms of regression and prediction, assisted search and retrieval, number or value predictions including dynamic or predictive pricing, predicting behaviors, predicting failures, and anticipating trends. This application of AI is primarily intended to assist and augment humans, help us figure out an answer to a problem, identify and select best fit or matches between data, optimization activities, guided assistance, and giving advice. Whereas with the autonomous system we’re deferring the action and the decision making to a machine, in this pattern, the human is still making the decision but the machine is helping the humans make the better decision. In this case it’s what we call augmented intelligence where it’s not replacing the human but it’s just helping them do their job better. It’s important to note that you can do predictive analytics without artificial intelligence, and obviously there’s ways of doing predictive analysts just using straight up statistics. However, the kind of predictive analytics we’re talking about here is adaptive where machine learning is necessary to improve predictive and decision making power over time. The conversational / human interaction pattern is defined as machines interacting with humans through natural conversation and interaction including voice, text, images, and written forms. The objective is to facilitate communication interaction between machines and humans, as well as between humans and other humans. Also within this pattern is the creation of content that’s really meant for human consumption, such as generated text, images, video, audio, and other content meant for humans. This includes machine to human, human to machine, and of course back and forth human and machine interactions. This does not include machine to machine communication because machines do not use human forms of communication. The primary objective of this pattern is enabling machines to interact with humans the way that humans interact with each other. We want machines to be able to have a smooth interaction with humans much as humans do with each other. Example use cases in this pattern include chatbots, voice assistants, content generation across a variety of forms including image, text, audio, video, sentiment, mood and intent analysis, and machine translation — which is using a machine to facilitate human to human communication. Machine learning has proven to be really good at interpreting and creating speech, images, and text, and as such we are seeing lots of different projects stemming from this pattern of AI. In the pattern & anomaly detection pattern, machine learning and other cognitive approaches are used to identify patterns in the data and learn higher order connections between information that can provide insight into whether a given piece of data fits an existing pattern or is an outlier and doesn’t fit. The primary objective of this pattern is to find which one of the things is like the other and which is not. This is used extensively to find anomalies in data and indicate what looks out of the ordinary. Example use cases include fraud detection and risk analysis, discovering patterns among data and surfacing insights, automatic error detection or correction, intelligent monitoring, finding hidden groups of data, finding best matches to given data, predictive text, and similar applications. Machines are great at taking lots of data and analyzing it finding patterns — a lot better than humans and they can do it a lot faster as well. We define the recognition pattern as using machine learning and other cognitive approaches to identify and determine objects or other desired things to be identified within some form of unstructured content. This content could be images, video, audio, text, or other primarily unstructured data that needs to have some aspect within it identified, recognized, segmented, or otherwise separated out into something that can be labeled and tagged. The primary objective of this pattern is to have machines identify and understand things within otherwise unstructured content. Example use cases include image and object recognition (the traditional space of computer vision), the subspecialty of facial recognition, sound and audio recognition, item detection, handwriting and text recognition, gesture detection, and identifying what is happening within a piece of content. Recognition is a very well-developed pattern and through machine learning, computers have gotten really good at it. The recognition pattern is one of the most widely used and adopted of all AI use patterns. The final pattern of AI that we’ve identified are goal driven systems. We define this as using machine learning and other cognitive approaches to give your agents the ability to learn through trial and error. The primary objective of this pattern is to find the optimal solution to a problem. Examples of this pattern include scenario simulation, game playing, resource optimization, iterative problem solving, bidding and real time auctions. Some of the most famous use cases and examples of this pattern are dominated by reinforcement learning approaches to machine learning. In particular, DeepMind’s approach with AlphaZero is goal-driven systems pushed as far as they can go. DeepMind’s theory is that if a computer can learn through trial and error, just trying a whole bunch of things, then a system could theoretically learn anything. The above patterns identify different objectives for use of AI, but any project or implementation can have one or more of these patterns. In fact, most advanced applications of AI combine patterns together to achieve whatever the outcome is. The important thing is to identify which patterns are being used, because the patterns will dictate how you run and manage the project to meet those objectives. For example, say you’re building a chatbot that’s going to help you pick the best product for a particular need. To make the chatbot work, we need to apply the conversational pattern. But this just deals with the ability to hold a conversation. It doesn’t inform at all the ability to actually choose the best product for you. It turns out that choosing the best product is a completely separate AI pattern that needs its own modeling and project development. So we need to combine the hyperpersonalization pattern with the conversational pattern to get a chatbot that can target recommendations for our particular needs. And if we need some more advanced predictions, then we need to add to that a predictive analytics pattern, with its own machine learning model and project evolution on top of that. Instead of one monolithic AI project, we have three discrete AI projects that each achieve different objectives, but combined together, achieve the business requirements. Each pattern requires its own machine learning and cognitive process but you can combine it together to form a project. How do I put these seven patterns into practice? 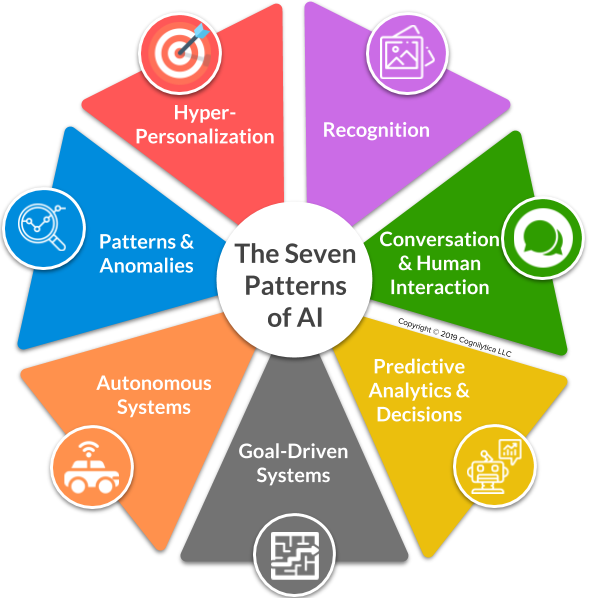 We specifically cover how to apply these Seven Patterns of AI in the context of our Cognilytica Project Management for AI Methodology training bootcamp. In this bootcamp we even have built worksheets to help you pin down more specifics about what the project management requirements are for meeting the objectives of each pattern and walk through additional use cases and examples which is helpful when trying to apply these patterns to real-world use cases for your organization.